Have you ever seen the Temperature Warning on the iPhone before, saying “iPhone needs to cool down before you can use it”, appearing seemingly out of nowhere? If you’ve ever left your iPhone outdoors on a hot sunny day for too long, you probably have. And if you haven’t seen that warning, let’s try to keep it that way by heeding some simple advice. In case you’re thinking “who cares” and wondering why overheating matters, here’s why: Prolonged exposure to excessive temperatures and heat can damage an iPhone and the internal battery (this applies to most electronics and Macs too, by the way). These things are expensive and a major part of many of our digital lives, so we want to keep them in the best shape possible for as long as possible, and avoiding heat is a good way to help an iPhone last. To be clear, you should never see this temperature warning during any normal iPhone operating situation, it almost always requires some external heat source to cause. If you’re sitting indoors minding your own business and you see that warning, your iPhone may have some other problem and you might want to contact Apple Support to get it looked at. Even on a medium temperature day, leaving an iPhone in direct sunlight can cause the device to quickly overheat, so you’ll want to avoid leaving the device in direct sunlight. I’ve experienced the Temperature warning simply by leaving my iPhone screen-up on an outdoor table on a fairly moderate 75 degree afternoon, so it can happen even in moderate climates if the conditions and sunlight are right. The interior of closed cars can get extremely hot – as in cookie baking hot – on sunny and warm summer days, so even if you use your iPhone as a dashboard navigational aid, don’t leave it in the vehicle if you plan on spending some time outside of the car. This includes leaving it on a car seat or in the cupholder while you’re running errands, either bring it with you or put it somewhere that it’s not going to be subjected to sun and the full brunt of a hot day. This seems fairly obvious, right? But how many times have you just set your phone down somewhere new without thinking twice about it? I’ve had friends leave their iPhones on closed waffle irons and right in front of heating vents, each received the temperature warning (and an extremely hot-to-the-touch device, that’s really not good). So just be cautious about where you’re setting the iPhone down, and avoid heat sources, particularly if you’re in an unfamiliar place. 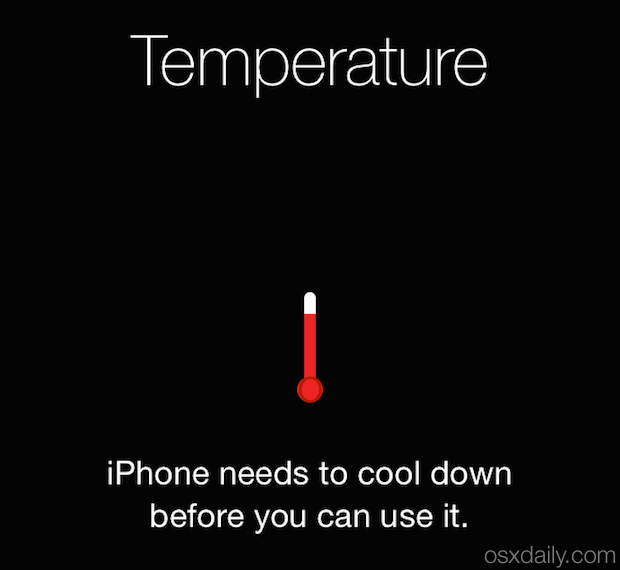 Too late, I have the Temperature warning saying my iPhone needs to cool down, what should I do? If you already see the “Temperature – iPhone needs to cool down before you can use it” message, then you need to take a moment to address the issue. Remove it from the heat source right away and try to help cool it down. There are various ways you can cool down an iPhone, but removing it from direct sunlight or a heat source is a great place to start. To cool it down directly you can try some tricks too, whether that’s placing it on blasting AC vents in a car, putting it in front of an air fan, stuffing it in a refrigerator for 2 minutes, or whatever is reasonably safe and effective, just try to cool the iPhone down to a normal temperature to avoid any damage. Once it cools down and you can use the iPhone again, follow the aforementioned advice to keep it cool, and avoid situations where it could be operating in an abnormally warming environment. Finally, keep in mind that some third party cases can make overheating happen faster, and can even make it worse, by preventing the iPhone from dissipating heat as it’s built to. Thus, if your iPhone is overheating and you have that warning screen, you may want to pull off the case to help it cool down quicker. You can always put it back on when it’s back to normal again. 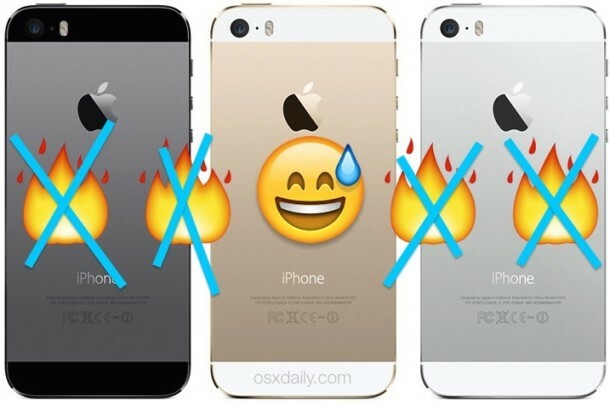 Do you have any experience with the iPhone “Temperature” warning? Any great ways to avoid or fix it? Let us know in the comments below! Charging the phone generates significant heat. Avoid needing to plug your phone in in the heat. Using the GPS with the phone plugged in to a 2.1 amp adapter in Arizona one summer got me a warning! My iPhone used to turn off or get very hot in warm sunny weather while using GPS, listening to podcasts, and charging, all while in a suction-cup windshield mount. I started to run the defrost to try to cool it, but that takes away from the rest of the car’s AC. I got a Kenu vent mount instead and although the phone isn’t in my direct line of vision, the AC blows right on it and it stays cool; as a bonus for travel the mount is much smaller. Do not put in fridge, temperature will drop to fast and can cause micro fracture on the logic board. You want to cool off slowly to avoid such a thing. Put it front of fan, let it blow the hot surface air of constantly. This way you will cool the phone off little by little. -if you feel the phone warming up as you use, you can turn off bluetooth and wireless to make it use less power -> less heat generated. hey guys i am facing this problem while my battery is drain too what should i do any help??? So I live in Alaska and have been getting this warning about my phone needing to cool down at 25 degrees. It’s really not too hot and there is no way it is overheating. Anyone else have this issue or ideas on fixing it? I was outside walking in 23F for 1 1/2 hours and got that warning that iPhone 5s had to cool down. How is that possible? Phone was exposed to cold air. Did that cause problem? No cold air is not a problem for iPhone, I was using mine in 9°F weather today. Very cold, iPhone works fine. 23 degrees and got overheating msg. Turned off, restarted and no problem. Same as Roy! Outside plowing snow on -13C day. 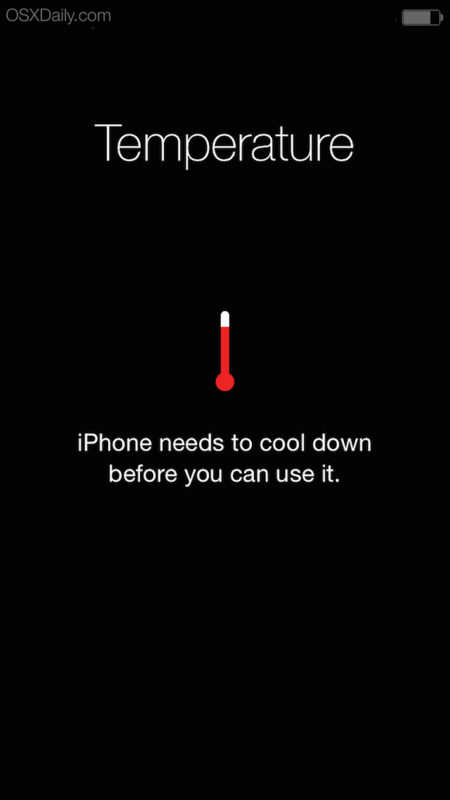 Phone in outside pocket of coat, listening to music and got the message that it needed to cool down. Really?? Out walking today–it was 20 degrees F. Both my wife and got this warning on our iPhones (a 5S and 5). Both phones were cold, not hot. My phone was using the GPS (MapmyRun) but hers was not. We have had this happen before. I left mine in the car at 5 degrees for 90 minutes. Said it was too hot and needed to cool down. What would cause this? Should I be worried? I was emptying the hopper after I was done salting last night and it was 7° with a -10° windchill and got that message. Couldn’t use the flashlight to see how empty the hopper was. Good thing the shop had an old fashioned flashlight. I experienced this today but the phone was ice cold..?? was in phone holder ?? After I finshed clearing snow..
I’ve had my iPhone 5 up to 106.7 and never got a to hot warning. Can someone help me? I was in the sun today and went inside to put my baby to sleep not for long though, and came back outside and my phone was off, I presume the warning note came on and then it obviously just turned off on its own and now several hours later it won’t turn back on or charge nothing. please help. Same thing just happened to me, did you get it figured out, mine dead as a door ail! i was taking a nap and had my phone under the pillow. it must have shown the over heating message and it turned off. Will not tun back on even though it is cooled down. please someone help me. this happened to me too ! and 2 nights ago. i woke up in the middle of the night to check the time and its was under my pillow and so i left it to cool down and for 24 hours because it got really hot again within 5 mins of using it and now i cant use it for long. im charging it for the first time and its boiling. What about freezing ? Subzero temps could lead to the same situation.. Optimal Case is due to handle these issues on selected Apple smartphone models. my iPhone hot and got the temperature msg and I left to cool down and as I switch on and still got hot. want to knw using wrong charger can cause that? I use FaceTime video call frequently.Is it problem for iPhone 4s?because suddenly one day in the screen displayed overheating problem. Dropped my iphone4s into the lake..got it dry(I think) turns on n works for about 5 mins then the temp deal what do I do? I should have let it dry for 48 hours at least! don’t open it again. I got this warning last evening, immediately turned it off, but switching it on after an hour later after cooling did not help either!!! The phone runs for a minute and gives the warning sign again. I have been trying to turn it off and on since last 24 hours only to see the process get repeated. What am I to do?? I got this warning last evening, immediately turned it off, but switching it on after an hour later after cooling did not help either!!! The phone runs for a minute and gives the warning sign again. I have been trying to turn it off and on since last 24 hours only to the process get repeated. What am I to do?? 10 minutes after use iphone giving a warning over temperature and then on off and again same thing happen so what is solution of this thank you. is that possible if the phone get over cold? My phone got warm after 5 mins. It’s going back to the shop. I’m not paying all this money. Actually don’t put it in the refrigerator! Doing that may cause condensation leading to even more damage. DONT PUT IT IN THE REFRIGERATOR!! Put my iphone in my pocket with the camera still active (inadvertently) in the middle of summer (>35 degrees C). When I got it out a little later had the temperature warning. Just let it cool naturally inside on the desk and all good. My phone is heating up while charging n charger too. Sometimes charging is finishing up quickly. Wht shud i do. Plz let me knw. But what is up with your terrible grammar and spelling? Is “Wht shud i do. Plz” really how you type? You would fail my class, either write properly or don’t write at all. Bela. How do you know this? My iPad was out in my car 30° ish , my music plays but can’t get my iPad to work or shut off , putting it by a fan rather than heat help ?